Dark foods and drinks, such as black coffee, red wine, blueberries or tomato-based pasta sauce. Poor dental hygiene – not adequately brushing, flossing and rinsing with mouthwash. Certain medications, such as antihistamines and drugs for high blood pressure. 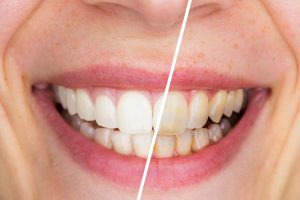 Regardless of why your teeth are no longer the bright shade of white they once were, a cosmetic dentist in Bonita Springs can help return them to their former glory with professional teeth whitening treatment. Both at-home and in-office teeth whitening treatments offer effective options for brightening your smile. If you wish to brighten your smile gradually or have sensitive teeth or gums, at-home teeth whitening may be the right solution for you. First, your dentist will create impressions of your teeth and gums to fabricate stone teeth models. Next, the models are used to create custom-made clear trays that will fit comfortably in your mouth. Just apply whitening gel to the trays and wear at home as directed, and your teeth will soon become several shades brighter. In-office teeth whitening, on the other hand, delivers fast results for patients that wish to see an immediate improvement. At the dentist’s office, a special material is used to protect the gum tissue, before a powerful, highly-concentrated teeth whitening gel is applied. The impressive results of in-office teeth whitening are achieved in a single visit, allowing you to walk out the door with a brighter, more confident smile than when you arrived. Don’t let discolored or stained teeth sap your self-confidence and prevent you from living life to the fullest. Contact a dentist in Bonita Springs today to discuss how professional teeth whitening can give you a radiant smile that will light up the room. The knowledgeable and welcoming team at Pelican Landing Dental offer comprehensive dental care to patients in Bonita Springs, Estero and throughout Southwest Florida. From preventive dentistry to professional teeth whitening, patients can rely on Pelican Landing Dental for all their oral care needs. Patients old and new can learn more about the practice by visiting their website or by calling the office at 239-948-2111.